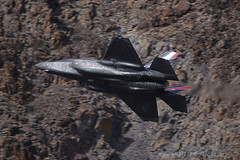 NAS China Lake located in Ridgecrest, CA just had its first air show in twenty years. The home squadrons, VX-9 Vampires and VX-31 Dust Devils, each had the various airframes from their squadrons on display including the F/A-18D Hornet, F/A-18E/F Super Hornet, EA-18G Growler, and AV-8B Harrier. All three variants of the F-35 Lightning II were on display as well. The RNLAF (Royal Netherlands Air Force) brought the F-35A, the RAF (Royal Air Force) brought the F-35B, and US Navy brought the F-35C. The remaining static displays were three NASA aircraft from Edwards AFB, a few warbirds, and a few more aircraft from the USAF and US Navy. There were also interesting displays of weapons and equipment that have been developed and tested at China Lake. The US Army Special Operations Command Parachute Team, The Black Daggers, started the air show by jumping from the VX-31 SH-60 Seahawk. They performed their technical maneuvers during the National Anthem, with two members presenting the American Flag. Spencer Suderman flew his Pitts S-2B through his high G program. He holds the record for performing the most consecutive inverted flat spins. Dan Buchanan and his Hang Glider then took to the air to fly an elegant routine, always a crowd favorite. VX-9 launched two Super Hornets to demonstrate their capabilities. One was an F/A-18F and the other was an EA-18G that was clean without the jamming pods. After making afterburner takeoffs and high speed passes, they made a simulated attack with a wall of fire followed by a carrier break and landing. Following the Hornets, a F8F Bearcat and a Spitfire Mk. XIV started up in front of the crowd and took off for a tribute to World War II. Each aircraft had its own distinct sound: the Bearcat with its large Pratt & Whitney radial engine and the Spitfire with its supercharged Rolls-Royce Griffon V12. It was a beautiful display of classic aircraft. Next up was Anna Serbinenko and her Super Decathlon “Sky Dancer” painted up in similar colors as the Blue Angels. She performed a very graceful ballet like routine. Jacquie B took her bright red Extra 300 to the skies for an aerobatic demonstration, performing an exciting demo and putting the aircraft through its paces. We'd like to thank the men and women of NAS China Lake for putting on their first air show in over twenty years. Job Well Done! The Black Daggers then returned to the skies in the VX-31 SH-60 to perform a demonstration of a tactical jump and insertion into enemy territory. They jumped from a higher altitude this time and had all their combat equipment with them. Spencer Suderman returned to the sky to race against a Ferrari 430 & Lamborghini Gallardo from Precision Exotics. The event started with the Pitts racing the Lamborghini down the runway followed by Spencer performing a turn and then racing the Ferrari in the opposite direction down the runway to the finish line. The US Navy Blue Angels Flight Demonstration Team were up next. The crowd packed closer to the flight line in anticipation, and they were not disappointed. Every formation was perfect, and the jets performed flawlessly. It was a fantastic performance to close the Air show.